Party officials say breakup is part of standard procedure prior to new elections, won't affect negotiations for new joint run. The United Torah Judaism party has filed a request with Knesset officials to approve its split into its two constituent factions Wednesday. The move, which is expected to be approved, will end the joint UTJ list in the 20th Knesset, leaving in its place the non-Hasidic Degel Hatorah and Hasidic Agudat Yisrael factions. UTJ party officials told Behadrei Haredim that the move was “procedural”, and would not hamper negotiations towards renewing the alliance for this year’s Knesset election. But talks between the two factions regarding a united list for the April elections have stalled in recent weeks, with mixed signals from party officials regarding the prospects for the UTJ alliance. 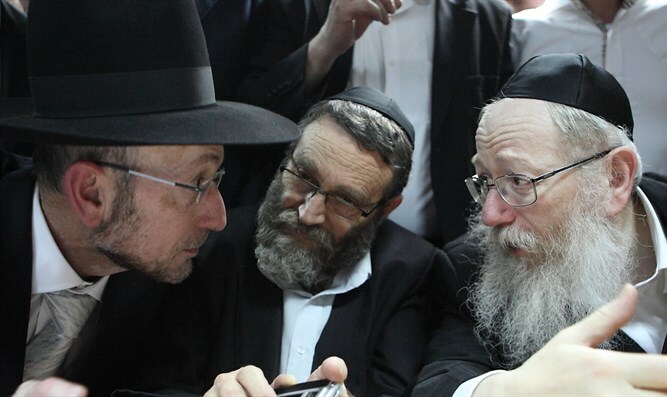 While Deputy Health Minister Yaakov Litzman (Agudat Yisrael) expressed confidence that the two parties would run together again in the elections for the 21st Knesset, officials from Degel Hatorah said the party was exploring the feasibility of running separately. With the 3.25% electoral threshold remaining in place – equivalent to nearly four seats in the Knesset – Agudat Yisrael and Degel Hatorah would be hard-pressed to win enough seats to enter the Knesset again if they ran separately. The joint UTJ list won six seats in 2015, and is polling at between six to seven mandates currently. The two factions may also pursue separate alliances with other haredi factions, including the Sephardic Shas party and the Bnei Torah (Etz) faction, which broke away from Degel Hatorah and is linked with the anti-draft Yerushalmi Faction.